The IRAW@Bagan project is aimed at developing an integrated socio-ecological history for residential patterning, agricultural practices, and water management at the classical Burmese (Bama) capital of Bagan, Myanmar (11th to 14th centuries CE). As part of this long-term research program investigations have been initiated in the Tuyin-Thetso uplands, located 11 km southeast of Bagan’s walled and moated epicenter. This mountainous area figures prominently in the chronicles of early Bagan, given that it was one of five places around the city that a royal white elephant carrying a Buddhist tooth-relic kneeled down, prompting King Anawrahta (1044-1077 CE) to build a pagoda (i.e., temple) there. Numerous 13th century religious monuments were subsequently built on the Tuyin Range. 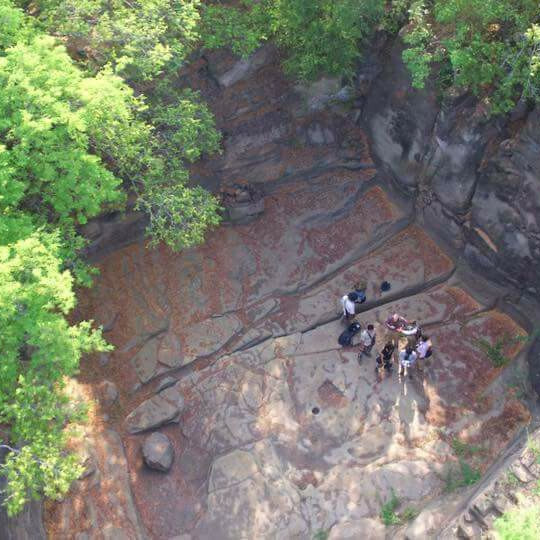 Recent explorations in these uplands have drawn attention to an additional feature of historical significance, a rock-cut tank located along the eastern edge of the Thetso-Taung ridge. Referred to by local villagers as Nat Yekan (Spirit Lake), this reservoir appears to have been integral not only to the initial collection and subsequent redistribution of water across the Bagan plain via a series of interconnected canals and reservoirs, but also, through its associated iconographic imagery, it may have been intended to symbolically purify this water, enhancing its fertility prior to its flowing into the city’s peri-urban zone. Hydrological modelling, excavations, and both iconographic and epigraphic analysis are used to build a multilayered understanding of Nat Yekan’s economic, political, religious, and ideological significance during Bagan’s classical era.